MILWAUKEE, WI--(Marketwire - June 1, 2007) - Trek Bicycle Corporation, the country's premier bicycle manufacturer, presented its long-anticipated reengineered Madone to more than 100 independent bike retailers, trade media and cycling elite Thursday evening at a gala event at Milwaukee's famed Calatrava-designed Art Museum. Trek President John Burke unveiled the new bicycle to an excited audience and then introduced special guest, cycling legend Lance Armstrong. Armstrong partnered with Trek Bicycle on the redesign of the Madone. "We felt the Milwaukee Art Museum, considered to be a pinnacle of architectural design, was the ideal venue to showcase Madone's superb design," said Burke. "And who better to help us introduce the all-new Madone than Lance, the man who rode Trek to seven consecutive Tour de France victories." The new Madone represents the largest design project Trek has undertaken on any bike, at any time. Charged with elevating the Madone from elite racing cycle to the consummate performance experience, an army of engineers, designers, physicists, carbon engineers, bike shop owners, project managers and riders spent the past two years transforming the Madone into the world's finest performance bike. The Madone underwent hours of FEA analysis, exhaustive real-world ride testing and 30 different lay-up schedules as engineers fine-tuned every detail of this ultimate riding machine. The result of their efforts is an exquisitely balanced bicycle that doesn't compromise ride quality for weight savings, and delivers an unparalled riding experience. 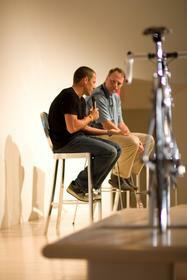 Response to the new Madone was enthusiastic from dealers and Lance Armstrong. Armstrong, a life-long holdout of sloping top tube bikes went so far as to say, "These guys finally got me to ride a sloping top tube." The Madone will be available at independent bike retailers beginning June 4, 2007 with prices ranging from $2,749 to $7,499. About Trek: Headquartered in Waterloo, Wisconsin, Trek Bicycle Corporation is a global leader in bicycle design and manufacturing. From the original hand-built steel touring frames introduced in 1976 to the revolutionary OCLV carbon fiber first introduced in 1992, Trek's passion for innovation, quality, and performance leads the industry with next-generation technology and thinking. With a record seven consecutive Tour de France titles, six straight 24-hour World Solo Mountain Bike Championships, and countless other professional wins, Trek enjoys a rich tradition of victory in the world's premier cycling events. Today, with a broad range of bicycles and cycling products under the Trek, Gary Fisher, LeMond, Bontrager, and Klein brand names, Trek continues to pursue new ways to bring the joy of cycling to all people.